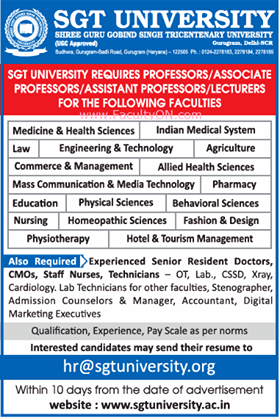 SGT University, Gurgaon has advertised in THE TIMES OF INDIA newspaper for the recruitment of Professor plus Associate Professor plus Assistant Professor vacancies. Interested and eligible job aspirants are requested to apply with in 10 days. Check out further more details below. About College: Shree Guru Gobind Singh Tricentenary University, commonly called as SGT University, is located in Budhera, Gurgaon district, Haryana, India, in the vicinity of Sultanpur National Park.The university (earlier known as the SGT Group of Institutions) came into existence in 2013 through a Government of Haryana Legislative Act. The school is operated by the Dashmesh Educational Charitable Trust.